A walking jungle safari at Bardia National Park, Nepal is surely a day filled with fun and excitement. Here's my experience of the national park. It was my second day in Bardia, Nepal when a couple came to stay at Bardia Wildlife Resort. I told the owner of the place that if someone was interested in a jungle safari at Bardia National Park, I would like to go with them as I didn’t want to go alone. The couple – Artyom and Tatyana – agreed to go on a walking jungle safari a day later and I joined them. We spent almost the whole day exploring the jungle and it was great fun. 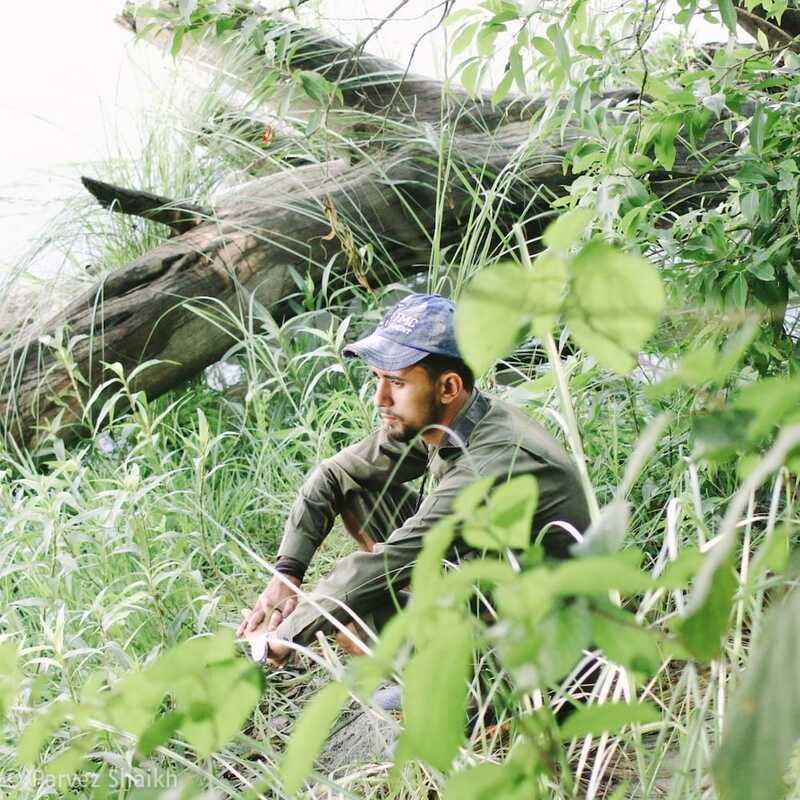 Here’s my jungle safari experience at Bardia National Park, Nepal. Our guide Keshab told us that we were supposed to leave for jungle by 6:30 am the next day. We were told to wear dark clothes and carry a backpack to pack our lunch and water bottles. I woke up early at 5:00 am in the morning with an excitement. Although I just went on a jungle safari at Shuklaphanta National Park a few days earlier, I was excited about going on a safari again. And it was walking safari, after all. I put on my Levi’s 511 slim jeans and tee-shirt, along with a Timex Weekender watch and US Polo Assn jungle camouflage cap for the safari. After getting ready, we had our breakfast. We packed our lunch and three bottles of water in our backpacks. Keshab told us that it was necessary to carry and drink at least three bottles of water throughout the day. We finally left for the national park at 7:00 am. We were a group of five – I, Artyom, Tatyana, Keshab, and a helper. 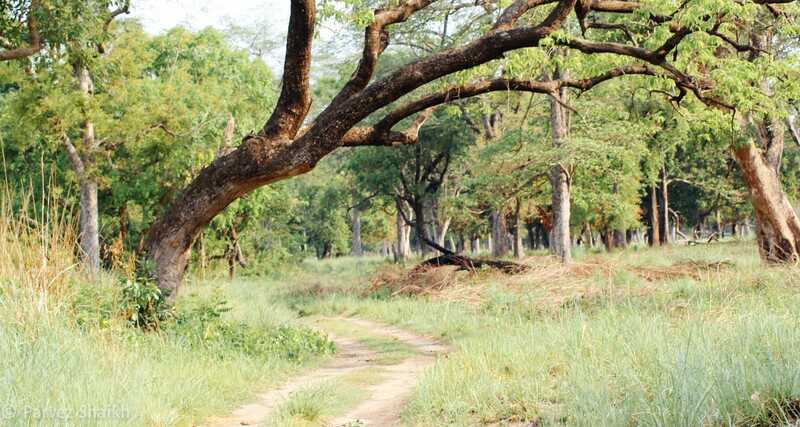 Bardia National Park is about 10 minutes walk from Bardia Wildlife Resort. We got to know each other along the way and reached the park. After reaching the park, we were to finish some entry formalities. Keshab paid the fees while Artyom filled out the entry register. The current fee to enter Bardia National Park is 50 Nepali Rupees for Nepali citizens, 500 NR for citizens of SAARC countries, and 1000 NR for other foreign nationals. A child below 10 years of age can enter for free. More information on Nepal’s national park entry permits can be found here. It took us about 10 minutes to complete the formalities and our adventure finally began. After walking for a few minutes from the entrance, we were to cross a river. I’ve never been to a river before and I’m not ashamed to admit that I have a fear of water. Although I’m trying to conquer this fear for a while now, I find it hard to be in deep water in large quantity. 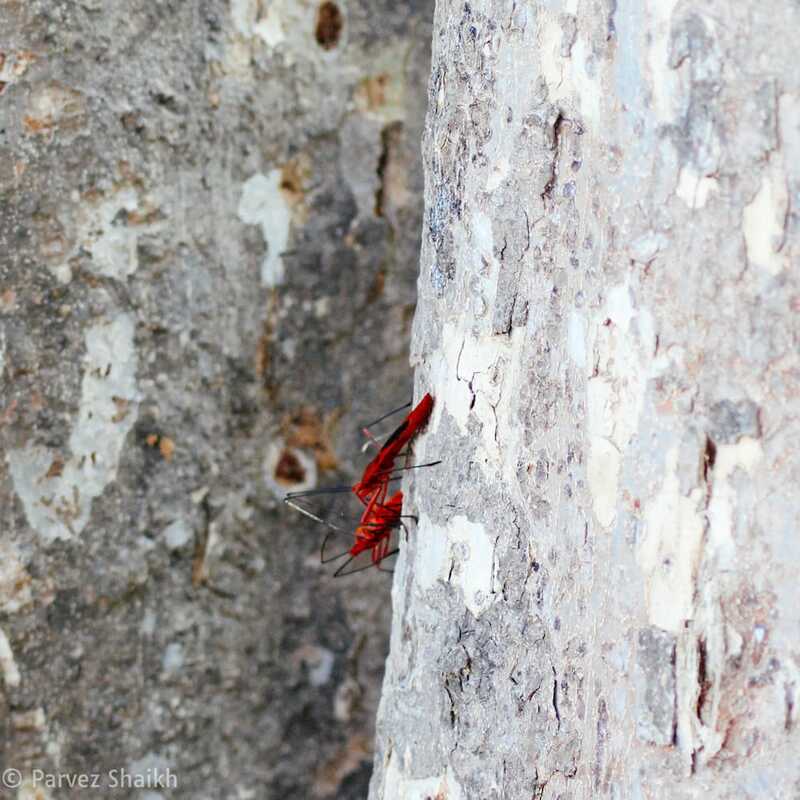 It came to me as a surprise when we reached the river. But for some reasons, my fear was overtaken by my excitement and I didn’t hesitate to enter the river. We removed our shoes and wore flip-flops. We carried a stick in one hand. I had my camera in the right hand and my stick and shoes in the left hand. We were patiently following our guide. It was fun, slowly moving in the river, avoiding those stones below our feet. Just a few moments before we finished crossing the river, my left leg slipped from a nasty stone. This caused my shoes to land in water and I got them wet :(. Moreover, this sudden slip made a muscle in my left leg move, and I was suddenly in pain. What a way to begin my adventure, I thought. After we finally crossed the river, everyone got back into their shoes, everyone but me. I carried on my journey in flip-flops and walked for almost two hours in them before my shoes were dry enough. After crossing the river, we entered the actual jungle area. As soon as we walked a few steps, we started spotting some huge piles of elephant poop. Walking further, we entered a grassland where we first spotted a wild boar and then some deer. Also present were some cute, curious monkeys. Throughout the jungle, there is a wonderful landscape – very different that what you will see at Shuklaphanta National Park. Enjoying the scenery around us, all five of us kept moving further. Along the way, Keshab was explaining us how to react when we encounter a tiger, a rhino, an elephant or other wild animals. 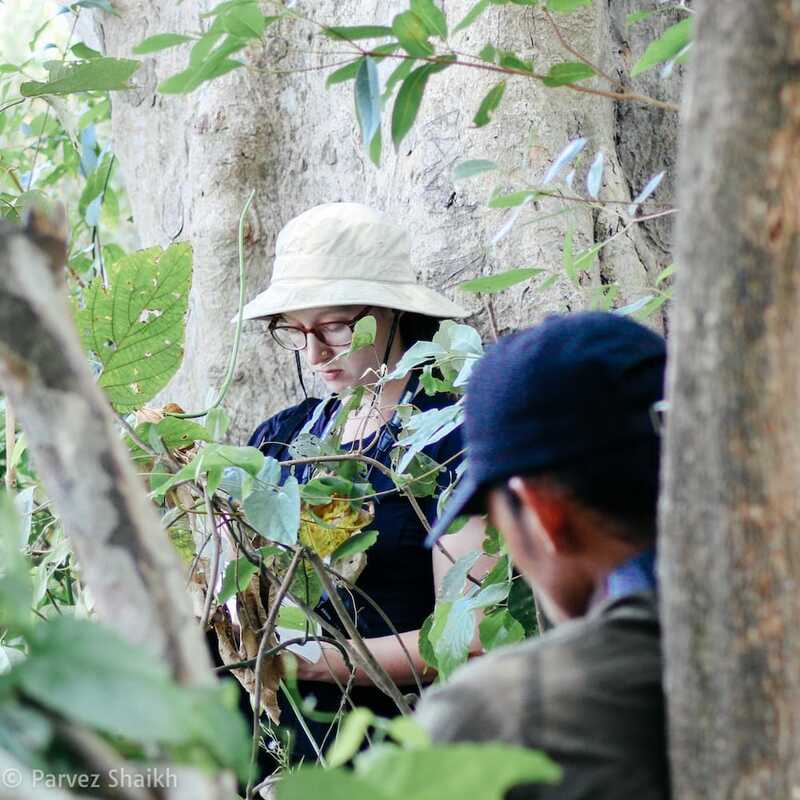 Walking around the jungle surrounded by beautiful landscape, we reached a place from where it is common to spot tigers and rhinos. You can ideally keep an eye on the river from this place and we saw two other groups already present there – waiting to spot some wild animals. As soon as we reached the place, our guide and his helper climbed a tree to keep an eye on the river. The three of us, along with other visitors waited on the ground and used binoculars to have a look around. We spent almost two hours at the same place and took our lunch sitting on the ground. The lunch pack provided by Bardia Wildlife Resort included fried rice, two boiled eggs and a pack of juice. It was a nice lunch, overall – better than what I was provided during my jungle safari at Shuklaphanta National Park earlier. By the time we finished our lunch, my shoes were almost dry. I put them on as it wasn’t really a good idea to keep wandering around the jungle in those flip-flops. Soon after our lunch, someone noticed a movement far in the river. It was a rhino! The rhino came in the river to enjoy its bath or something and while he was busy doing so, we observed it through our binoculars. The rhino was surely having fun, going in and out of the water and then sticking to the same place for a while. Its location was too far for my 30-700 mm lens to capture a sharp photo. I need better equipment, I know. But I still tried and this is what I could capture, after all. We enjoyed the rhino enjoying its bath for a while before we moved ahead. After a long walk around the jungle, our guide was told by other guides over the phone that there were some rhinos at a place. Excited by this intel, we started walking in that direction. A group from another place also joined us and they were leading the way. Walking behind one another, we were slowly walking deep in the jungle. Suddenly we heard the guide’s voice and everyone stopped right they were. We saw those three members of another group running and we absolutely had no idea what was going on. Everyone was looking at each other with a question mark in their expression. We stayed there for a moment before our guide called another guide and he was told that there was a rhino! Hearing this, our guide Keshab asked everyone to climb a tree. Not to mention that I had never climbed a tree in ages and I wasn’t willing to climb one. I wanted to capture a photograph of this nasty rhino but Keshab insisted I climb a tree and stay there. Well, he was the guide, and I had no other option than to follow his instruction. I found a tree and climbed. This was one of the most exciting moments for all of us. We didn’t really see that rhino ourselves but knowing it was just nearby was enough to pour some drops of satisfaction in my brain. A few minutes later, we heard some sound through the trees. It was the rhino leaving the place. Soon after the sound was gone, we came down from trees and shared our excitement with each other. After a close encounter with a rhino, we started walking towards the exit. 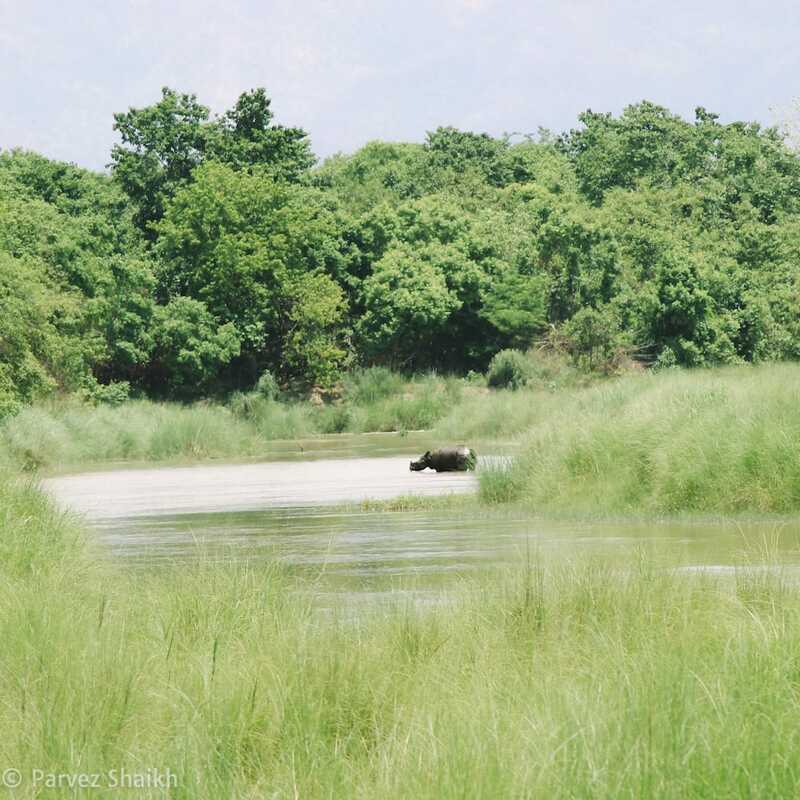 On our way, we crossed a river again and saw two rhinos enjoying their day in the water. After this, we continued our walk towards the exit. 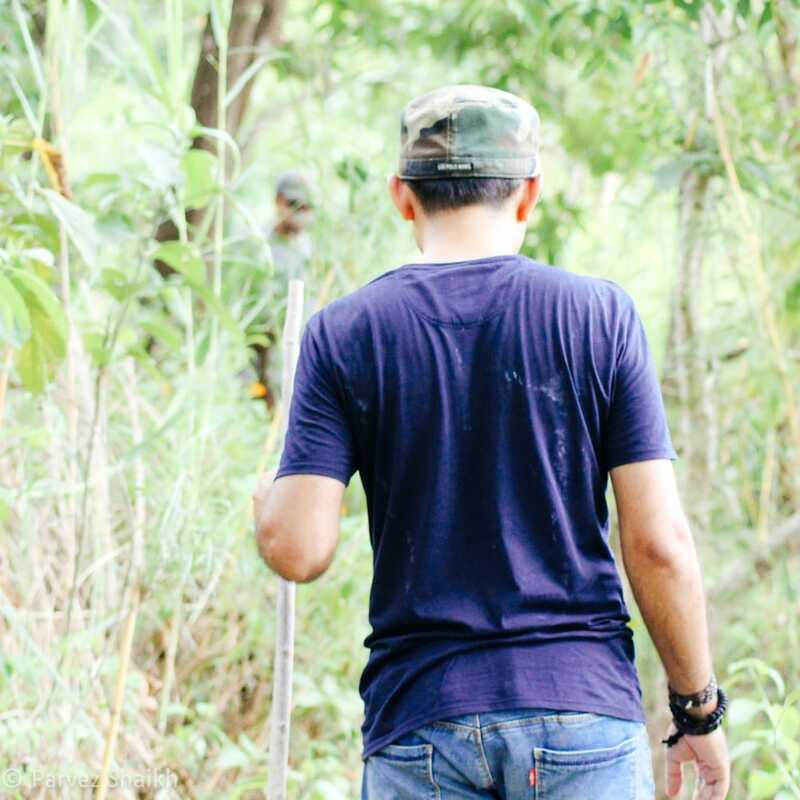 We were walking through the jungle and Keshab was leading the way. I was right behind him with others behind me. Suddenly Artyom whispered Keshab’s name and he pointed towards an elephant standing right in the way ahead of us. Upon realizing that we were walking right into the elephant, everyone stopped and Keshab asked us to go back. We had a short run and observed the elephant from a distance. The elephant was enjoying its meal and upon seeing us, it stopped. A few moments later, it moved out of the way and went deeper in the jungle. 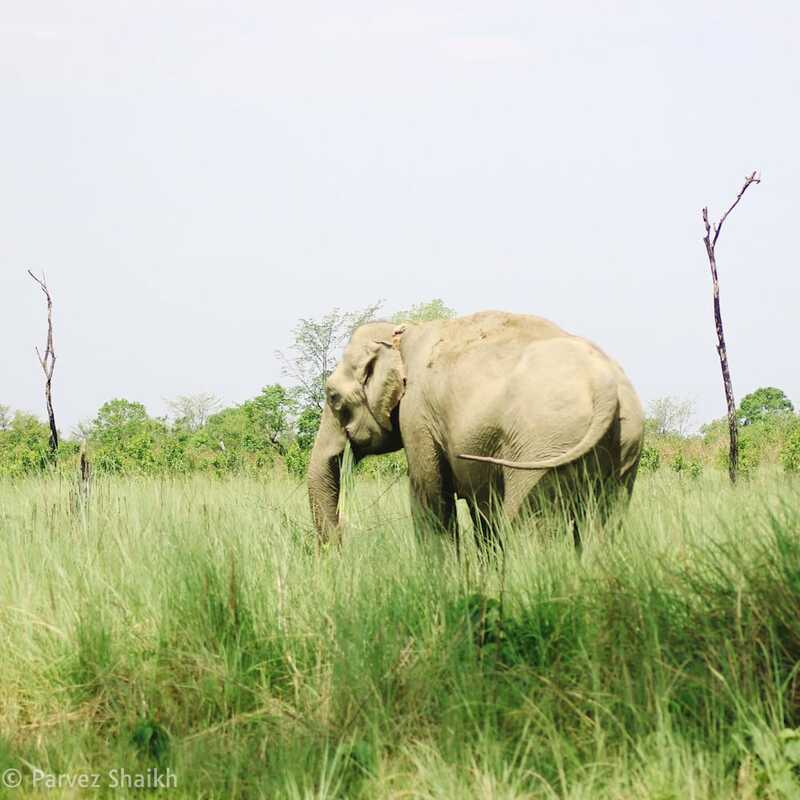 As soon as the elephant gave us the way, we ducked down and slowly moved ahead – making sure not to make any sound that might catch our giant friend’s attention. Moving ahead, I saw the elephant looking at us – possibly saying: “Go on guys, move out of my sight. I’m not in the mood right now.” Throughout this, a small monkey was keeping an eye on all of us from a distance. It was surely having fun seeing us all going crazy and running from the elephant. A few moments later, we were at a safe distance and everyone caught their breath back. It was the second time when we encountered a giant animal during the day and our excitements were higher than ever! Talking about our day filled with fun and excitement, we moved towards the exit. On our way, we spot some more deer and monkeys before we finally exited the park. My whole day was filled with exciting events and it was pure fun walking around the jungle. As with my jungle safari at Shuklaphanta National Park, I came to know more about jungle, nature, and wildlife. Closely observing the nature made me fall in love with its beauty and I can’t think of a day spent better. 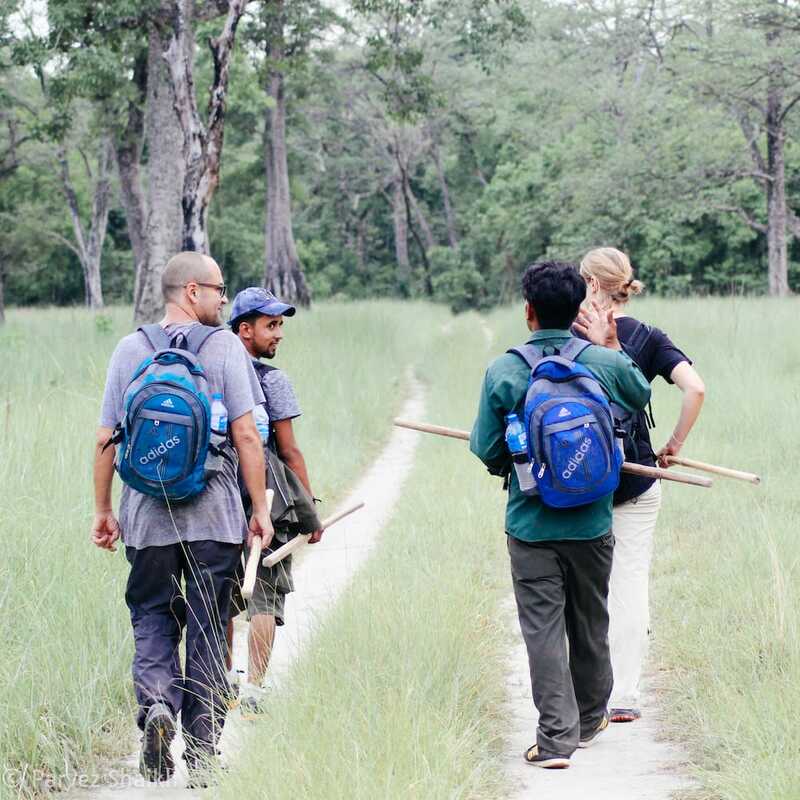 During our walking safari at Bardia National Park, we spotted some rhinos but we weren’t lucky enough to see a tiger. It was a bit disappointing but I know that the safari was not meant to be about tigers only, after all. It was about exploring the jungle, getting close to nature, and having an exciting day. Alright, folks! This was my jungle safari experience at Bardia National Park, Nepal. I hope you found this post worth your time and I would like to thank you for reading.